long radio silence was because of EXTREME business - its just been mental. But we are winning I guess. We have been trying to be more organised about getting stuff sent out to the studios overseas in as "bulletproof" a way as possible - makings ure the packs are correct, the posing works, the x-sheets work and all that stuff. 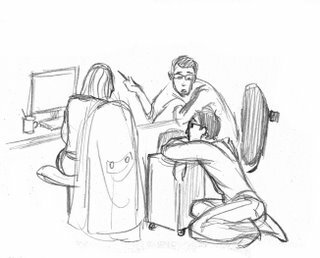 Heres a sketch of me (on the seat with the pen) , Nora (back to us) and Fabian (leaning on the cupboard) by Virginie a new posing artist from from France, we are discussing the sequences that are going to Hungary in January. 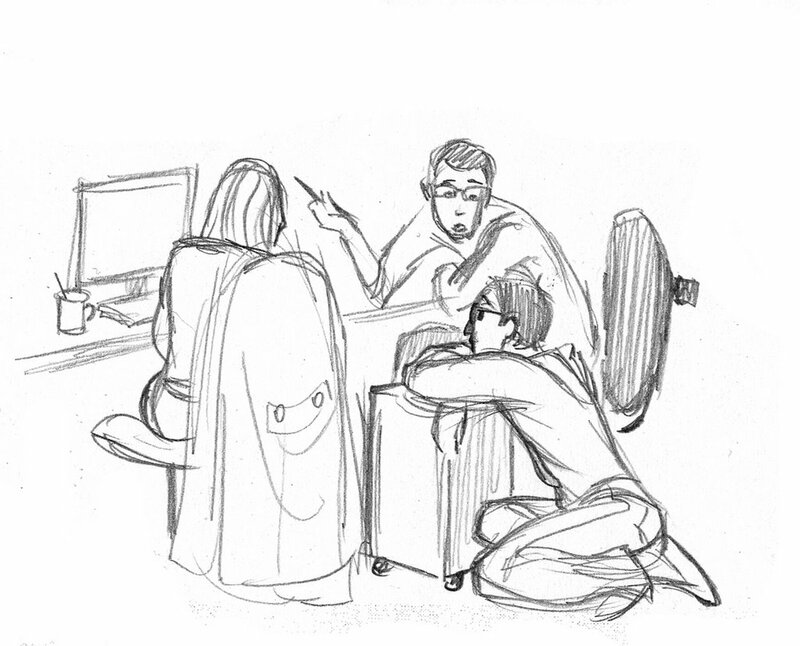 Its very hectic, with all the animation and layout and Bgs to look at here, posing to do, aniamtion from Brussels to check, rough composists of posing to check before they go, colour bgs from Spirit in Angouleme to check, and so on. But everyone is working like crazy and its going to be alright on the night I think.